There are many opportunities for walking in the parish, both on quiet roads and via an excellent and generally well-maintained network of footpaths. Gates and stiles are mainly in good condition and several have recently been renewed to a high standard by the Northamptonshire County Council. There are waymarking arrows and fingerposts where necessary. This is a gently undulating pastoral landscape and there are some surprisingly distant views to savour. Far from any main roads, the walks here can be enjoyed in a silence which is sometimes almost profound. However, this is muddy Northamptonshire and during the winter months wellington boots will usually be the preferred footwear! 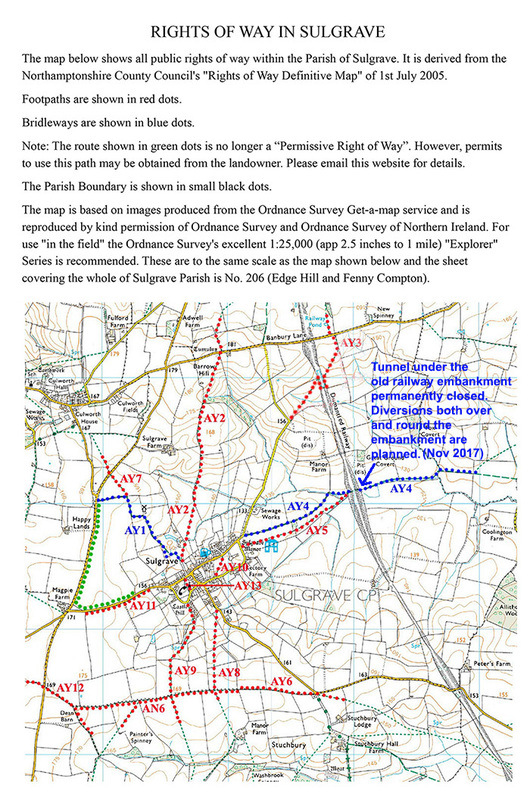 See here for a map showing Rights of Way in the Parish. See here for Photo Gallery of organised Village Walks, which it is hoped will be resumed in the not too distant future. No. 1 Star Inn to Village Shop via the Moreton Road and Footpath AY2 (see Rights of Way Map) – approximately 2.5 miles. No. 2 From the Village Shop via the Churchyard, Park Lane, Footpaths AY8 and AY9 (See Rights of Way Map), Helmdon Road and Church Street – approximately 1.5 miles.